Reservoir Quality (RQ) / Translucent Pressure Tubing. Designed specifically for pressurized air-oil system reservoirs, translucent Reservoir Quality (RQ) Tubing provides "at-a-glance" fluid-level indication from any angle. 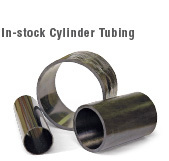 Typically used in systems requiring 150 psi or higher, RQ tubing is available in interior diameter sizes ranging from 1 inch to14 inches (metric sizes also available). 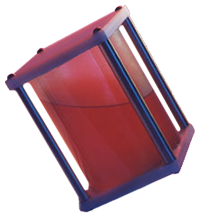 Translucent tubing eliminates the need for expensive and fragile sight glass. Chip resistant, dent-proof and formulated to withstand impact strengths of 40 lzod ft.-lbs. Ten times the tensile strength of polycarbonate, polystyrene, acrylic and other conventional thermoplastics. Trouble-free performance in chemical, acid, high-moisture, salt water and other corrosive environments. One fourth the weight of steel and 25 percent lighter than aluminum, RQ reduces material handling and shipping costs, speeds up assembly times and decreases stress loads on connected components. Amalga Composites has developed an extensive inventory of tooling to meet most needs; customized tooling can be quoted. We can stock products to meet your JIT, MRP, or KAN BAN requirements. Amalga Composites is a leader in the design, engineering and manufacturing of filament-wound composites to meet the tough environmental and performance requirements of the Fluid Power Industry. 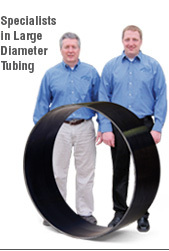 Call for technical assistance on sizing and pricing for RQ tubing and other composite products. We’re here to help you!